You'll turn heads and leave bystanders amazed when you rumble by in a new 2020 Jeep Gladiator, the newest member of the Jeep family. As the only open-air pickup in the industry, the new Jeep Gladiator is quickly establishing itself as the ultimate midsize truck. With 4x4 drivetrain capabilities, a great towing capacity and outstanding fuel efficiency, the 2020 Jeep Gladiator is ready to take New England roads by storm. Wondering when will the Jeep Gladiator be available? 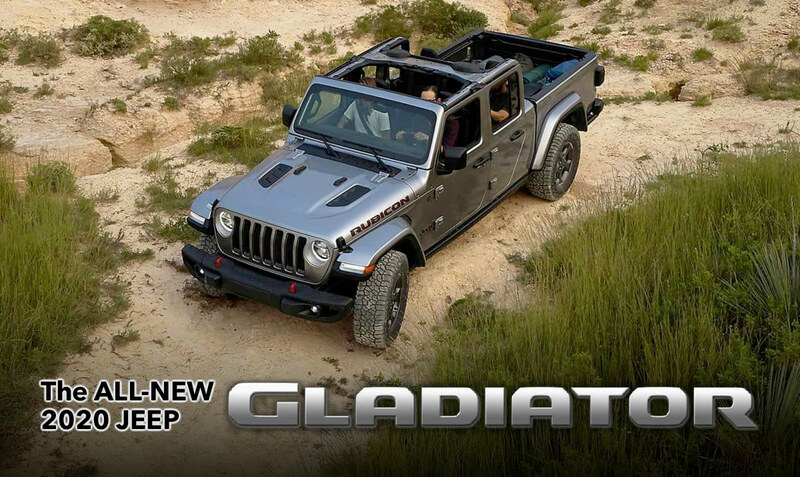 The new Gladiator isn't available yet, but with the 2020 Jeep Gladiator release date soon here, we hope that you visit our Jeep dealership in Haverhill, MA, to preorder your very own Jeep pickup. No matter if you lease a 2020 Jeep Gladiator Rubicon or finance a new Gladiator Overland, you'll benefit from spirited performance that you can't find anywhere else. Take advantage of best-in-class towing, as the 2020 Gladiator towing capacity can reach up to 7,650 pounds. Plus, with a class-leading payload of 1,600 pounds in properly equipped Jeep Gladiator trucks, you'll haul heavy loads with ease. And like its Jeep SUV brethren, the all-new Jeep Gladiator truck can dominate tough terrain thanks to standard Dana® 44 front and rear axles and a high- and low-range 4x4 system. Take the road less traveled whenever you're behind the wheel of the new 2020 Jeep Gladiator. Customize your cabin with the latest tech, and no matter which 2020 Gladiator trim you prefer, you'll have an array of 2020 Jeep Gladiator configurations at your disposal. This new Jeep offers a hardtop or soft top, along with the ability to drive with the doors off and the windshield folded down. Available perks like an industry-exclusive forward-facing TrailCam off-road camera and leather-trimmed seats will help upgrade your adventures even more, while an available largest-in-class 8.4-inch Uconnect® 4C NAV touchscreen with Apple CarPlay™ and Android Auto™ also provides you with an industry-exclusive removable Bluetooth® wireless speaker. As the most off-road capable midsize truck ever manufactured, the 2020 Jeep Gladiator will leave little to be desired. Contact Bill DeLuca Chrysler Dodge Jeep Ram to stay well-informed of any Jeep Gladiator news and updates, or stop by today to reserve a 2020 Gladiator truck and start exploring your Jeep financing options.